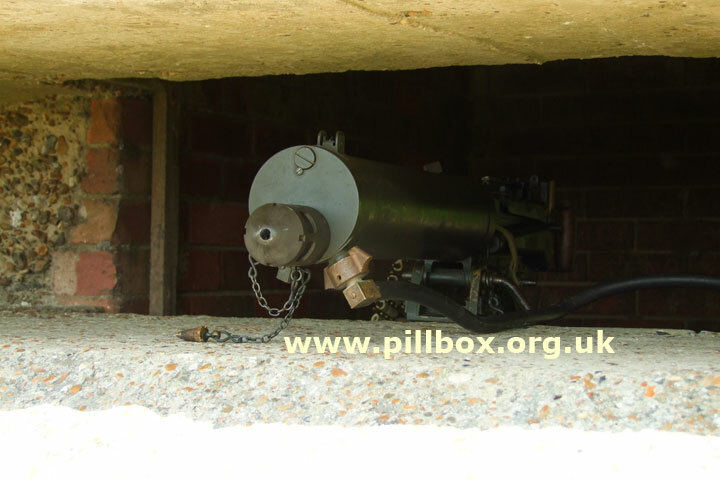 A short while ago I was presented with a fantastic opportunity to set up a Vickers Gun in a pillbox at Cuckmere Haven as part of a filming project. I ended up learning a lot about one of the pillboxes as a result. 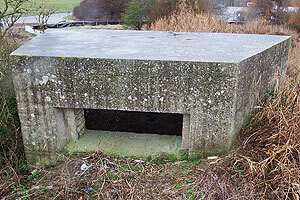 The structure in question is this one on the eastern side of the valley standing close to a Type 23 pillbox. 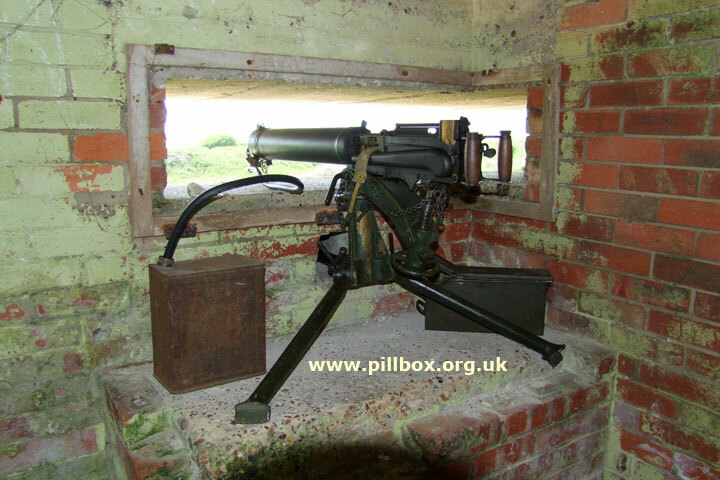 It's not built to a standard design, but I have always treated this as a pillbox intended to hold a Vickers Gun, along with two other pillboxes at Cuckmere that still survive. I based this assumption firstly around the walls which are 3 feet thick; these particular pillboxes are theoretically 'shell proof' and provide a higher standard of protection than nearby Type 23 and Type 25 pillboxes, the walls of which, at 1 foot thick, were only deemed to be 'bullet proof'. Therefore, whatever weapon is in this pillbox is getting better protection than the infantry small arms in the surrounding pillboxes. The other features that possibly associate these pillboxes with the Vickers can be seen in the photograph at left, taken from the entrance. We can see the solid gun table and a square pocket/tunnel let into the wall just above it; my assumption has always been that the Vickers tripod was supposed to have been set up 'backwards' on the table, with the rear leg being inserted into the pocket. After a few years of wondering, I finally had the chance to test my theory when special permission was granted for me to do this; unfortunately I only had about 20 minutes in which to set up, take photos and learn. The photo at right shows this old non-firing museum-piece set up - probably the first time a Vickers has been in here since 1942 and confirming the pillbox as being designed for the weapon. The gun itself is Australian-made, dated 1944 and has the smooth barrel jacket as opposed to the fluted type more strongly associated with the Vickers. The tripod is the Mk.IV, and it proved somewhat awkward for one person to set up and adjust the legs; the fact that some of the brickwork shuttering on the table was missing required some odd adjustment to one of the rear legs. This meant that the tripod platform itself was not strictly flat and level, and this shows in some of the photos below. On the left of the gun is the petrol can into which steam condenses back to water, to be reused in cooling the barrel, and the ammunition box is on the right. The first point of note was that although setting up a tripod on the ground whilst standing over it is easy, setting one up at waist height and backwards takes a little practice and is really a two-man job. I also found that lifting the gun (even without the water jacket being filled) and mounting it at arms' length was quite hard; again a two-man job. The photo at left shows the view from outside. I've always thought some of these pillbox embrasures were quite dangerously high (30cm in this case) and perhaps here we see a reason why - the condenser hose coupling hangs below the barrel jacket and needs some clearance above the embrasure sill. Its presence also affects gun depression. 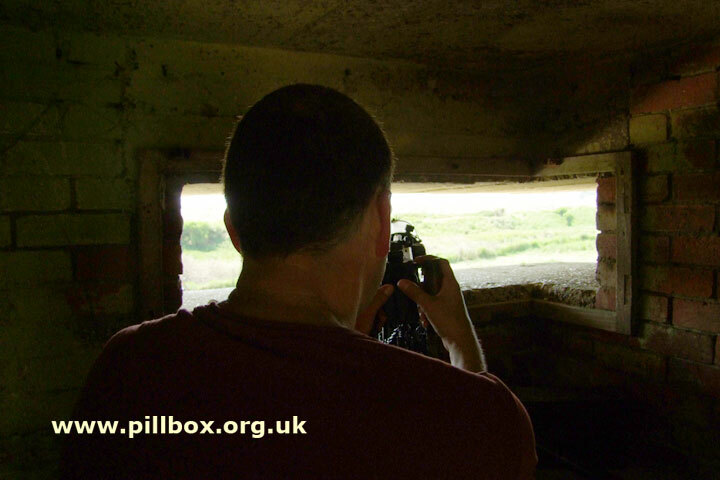 The height was emphasised as I was setting up the gun, when a bird flew in the door, through the pillbox, past me and out through the embrasure! The photo at right shows the gun set at its realistic extreme left arc - there was further swing to the left, but obviously not a good idea to shoot into the embrasure wall! Bearing in mind that the foresight is offset to the left of the muzzle, it would seem that it might just be possible to shoot through the embrasure of the nearby Type 23 pillbox - but only just - in the event of its occupation by the enemy. This was probably not easily done by accident, even in the heat of battle due to the probable arc of fire as discussed below. Note how the Type 23 is aligned in the landscape so that the embrasures are lined up in a way that would let the Vickers shoot all the way through the pillbox - coincidence or deliberate planning? It shows that these pillboxes have been located quite carefully and not just randomly thrown up in the landscape. I had wondered previously whether the Type 23's embrasure could be swept by this gun, but until I actually had a gun set up I'd never been certain. 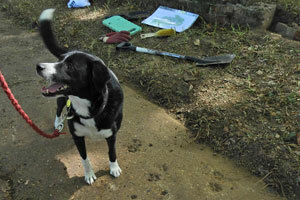 You can see perhaps my best side to camera looking along the most likely fire task. 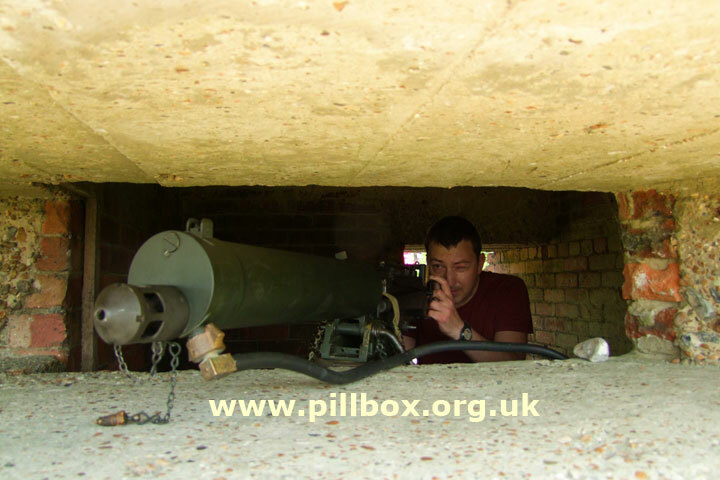 This position allows the gunner to be near the centre of the pillbox with sufficient space for the No.2 to be stationed to his right ready to reload. There are as yet no known documents that give the exact arcs of fire, but the narrower the arc, the more concentrated fire could be brought to bear. 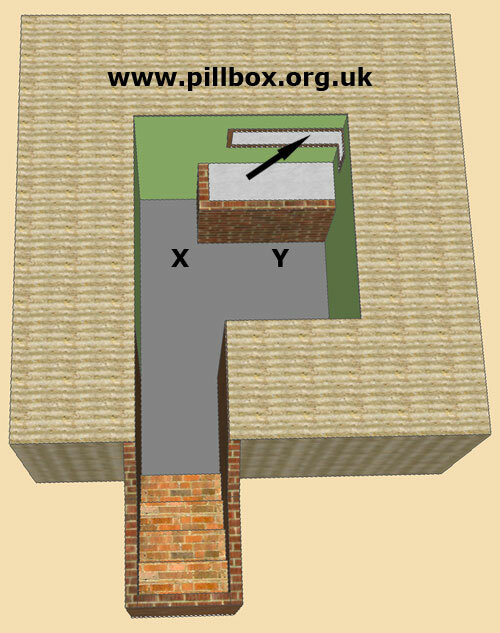 The position of the embrasure in the corner of the pillbox suggests the main fire task. The extreme swing to left would probably have been for emergencies only as it would be awkward for the gunner to move round, hence him being unlikely to sweep the Type 23 pillbox by accident. Earlier in the day (before the gun was set up inside) we managed to fit 3 men in here, but it was a bit of a squeeze. A further question concerning the vulnerability of the crew due to the large embrasure is raised by the Sketchup model at right; the roof has been removed to demonstrate the internal layout. The embrasure actually looks larger when viewed from outside as it splays outwards and the thickness of the walls it pierces exaggerates it; stand inside and the width appears considerably less, although I still think it's a few inches too high. Despite this, however, it would appear that the gunner actually gets more protection from the pillbox design than is first evident. There is a tendancy to stand at point 'Y' and feel vulnerable - you stand here because most of the floor is covered in rubble, mud and rubbish and it's here that you can see the most ground. 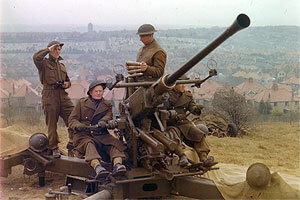 But the system of defence only requires the gun to cover part, not all, of the ground visible from the embrasure; other guns will be tasked to cover what it cannot and a lot of ground that can be seen cannot be physically swept by the gun restricted by its tripod mount anyway. But if the gunner stands at 'X' with the gun aligned with the arrow (our most likely arc of fire), the wall to his left covers him from fire from the front. At 'X' the gunner is now most vulnerable to fire coming from the direction he's firing in, and also any richochets off the back wall. He has an incentive in that he can probably shoot back at those gunning for him and keep their heads down, but we need to take a step back from viewing this as a stand-alone defence work - it's one piece in a network of defences. The gunner is not facing the entire German Ninth Army on his own - the invading force is going to be under fire from several positions (on both sides of the valley), they're cowering on an open beach trying to breach two belts of barbed wire fence, they have nowhere to hide and there's still minefields to cross. 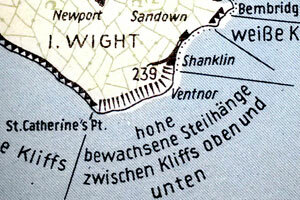 The Germans knew the locations of most of the pillboxes from aerial reconnaissance and so a preparatory bombardment from naval guns and the Luftwaffe would inevitably target these positions; the pillbox in question was shell-proof and so had a greater ability to protect its occupants. A direct hit or near miss would probably incapacitate some or all of the crew at the very least through blast, shrapnel or collapse, depending on the size of shell/bomb and proximity of impact. The gun itself would be at risk of damage - a ruptured barrel jacket would cause overheating. However, there's too many factors and variables for us to make a sensible comment on all this. Whilst filming a makeshift video, I tried cycling the cocking handle, only to have it jam in the upright position, as seen at left. I've caused this stoppage before; it's just a matter of fiddling with the lock and bottom cover until the problem is resolved. But I've never attempted this when the gun is high up and it suddenly made me think that without being able to look down directly from the top into the mechanism with the top cover open, a gunner under pressure and perhaps in darkness would need to be able to identify the type and cause of the stoppage while his No.2 would need to have the right tools/parts quickly to hand. 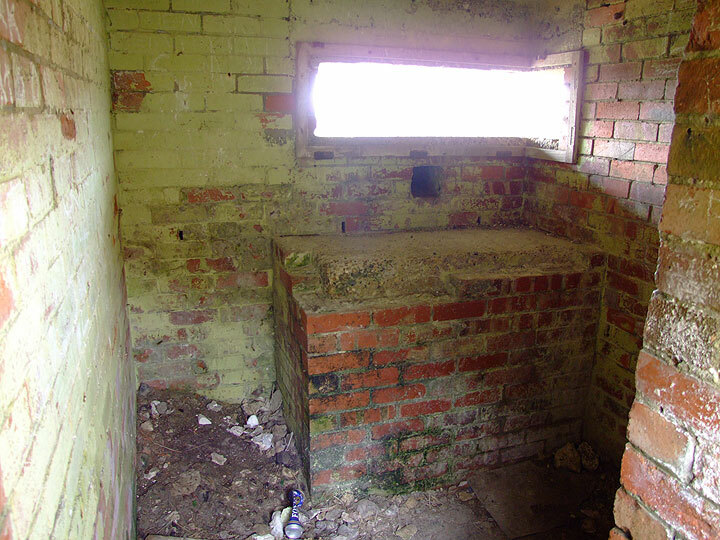 The original occupants of this pillbox in 1940 were Territorial, and despite having been mobilised in September 1939, one wonders just how much training, range time and ammunition allocation they would have had in the eight months before being suddenly flung into the front line. The War Diary of the MG Battalion in question does, however, show that an intake of 70 regular soldiers arrived in August 1940. 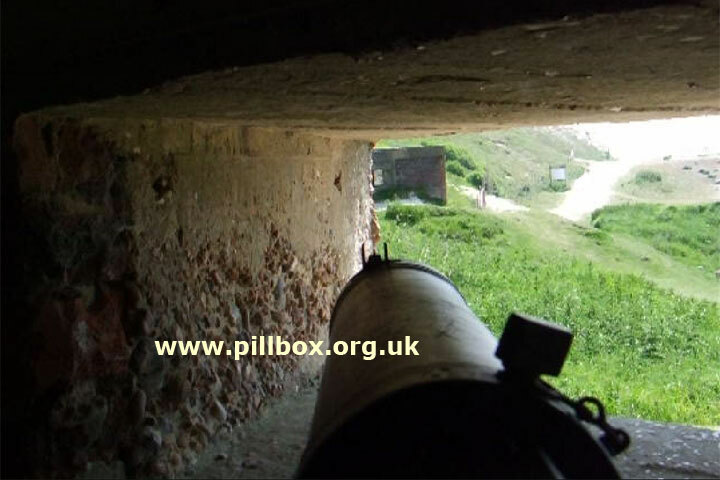 The crew needed to be especially tough to withstand being within the confines of the pillbox. The noise of gunfire echoing in an enclosed space would have been ear-splitting, but there was another danger - that of carbon monoxide gas. 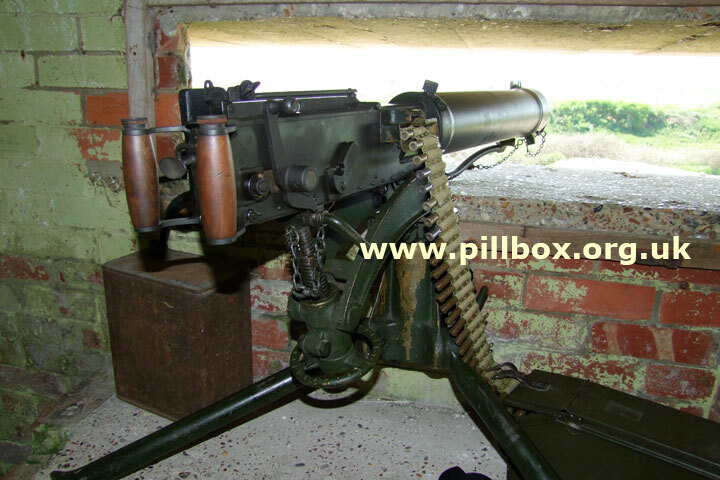 In July 1940, trials were conducted in a Vickers Gun pillbox with a partition wall that meant the only ventilation in the gun compartment was the embrasure. The trial was to determine the efficiency of the double parabolic blast deflector, a muzzle attachment, the purpose of which was to help push the carbon monoxide generated by the gun firing away from the gun crew. The trial involved 5 minutes of stop-start firing of 500 rounds followed by the crew remaining enclosed for a further 25 minutes. 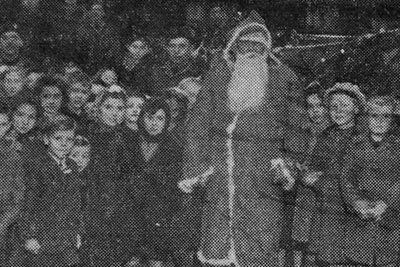 The trial was then repeated with a different crew and without the deflector fitted. The deflector seems to have made a great difference; during the trial without it, a greater build-up of smoke was noticed and a caged canary died after 12 minutes. The effect on the crew was not good either; all complained of severe headache, and one man nearly stopped breathing and had to be revived with oxygen during blood tests afterwards. 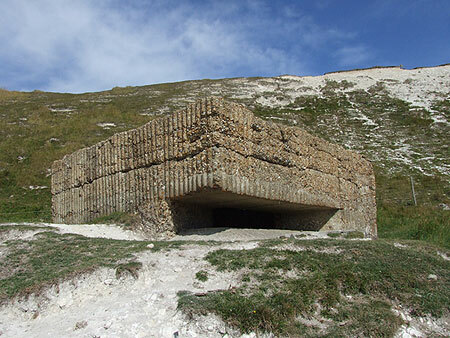 The report doesn't tell us the size of the embrasure, but the excessively large embrasure at Cuckmere Haven I was complaining about above doesn't seem quite so dangerous now, given the threat of carbon monoxide poisoning. The entrance at the rear also helps create a through-draft that would aid ventilation, so it may be that certain compromises were made to provide reasonable protection for the crew from a range of hazards. I started off thinking that this pillbox was a death trap and I still wouldn't have wanted to be in here in 1940, but it seems that the pillbox design and alignment has been far more carefully considered than I had initially thought. I filmed a very shaky video of a walk through the pillbox and mixed it in which some stills and the Sketchup model seen above. I also rested the camera on the gun while sweeping the extremes of its arc to give an impression of how the gun would have covered the raised shingle beach on the horizon. The gallery below includes larger versions of some of the photos above, plus a few extras. All in all, a very profitable experience - despite having only a few minutes to do all this, the combination of fieldwork, experimentation and documentary research yielded some fantastic results! My thanks go to all who made this possible.